Fall Color and Englishman River Falls in Englishman River Falls Provincial Park near Nanaimo, British Columbia, Canada. My trip to Vancouver Island was successful in many ways. I not only discovered some great Provincial Parks to explore, I managed some photos of these places that I quite like. I was also pretty lucky with the weather. 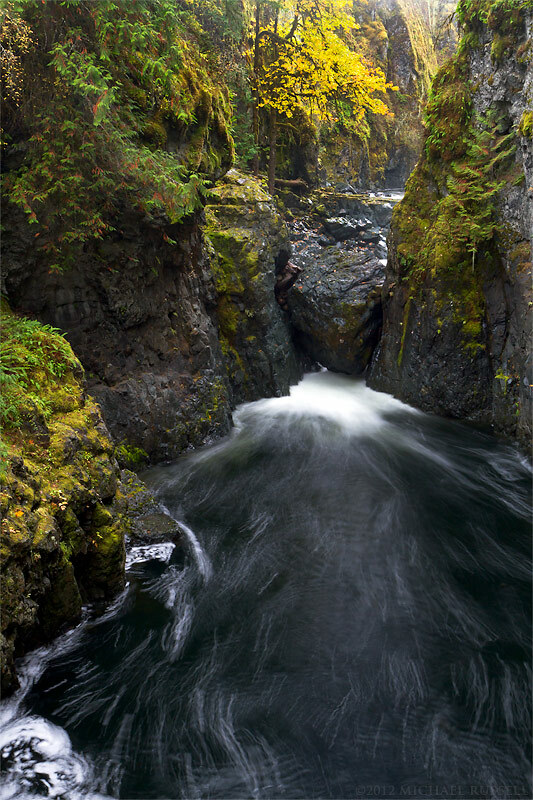 The 3 photos here are all from Englishman River Falls Provincial Park. I should point out this park differs quite a bit from Englishman River Regional Park if someone uhm, confused the signs on the way in. Not that I would do this of course. 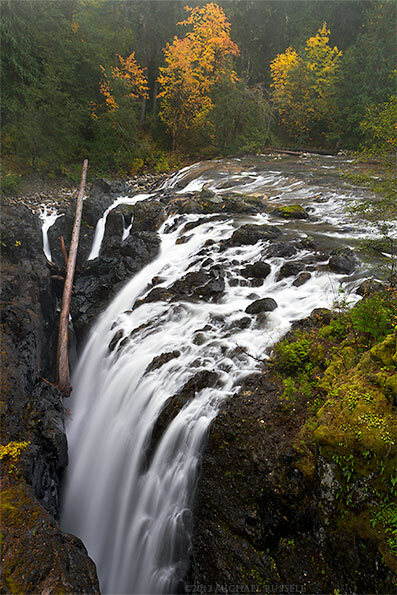 The first photo here shows the main Englishman River Falls. This is a much different sort of waterfall from what I am used to seeing. The drop from top to bottom is approximately 100 feet (31 meters) but this is pretty hard to tell from the bridge vantage point. The Falls flows into the side of a slot canyon (only about 10 feet wide), not directly in the end of it. The sideways slant to this falls makes it a bit difficult to photograph as well as determine exactly how deep the canyon is. The second photo here shows the Lower Englishman River Falls. Not quite what I was expecting, but there were some nice fall leaves above the falls and some interesting swirling patterns made by the bubbles in the water. During higher water levels the lower falls flows over top of the rock you see here which probably makes it a big more exciting, and look a bit more like a waterfall from this perspective. The last photo here is one just outside of the parking lot. I would be surprised if these were a natural occurrence, but I still liked the symmetry of these tree trunks. Not sure what species of tree this is, however. I hope to go back to photograph this park in the Spring! 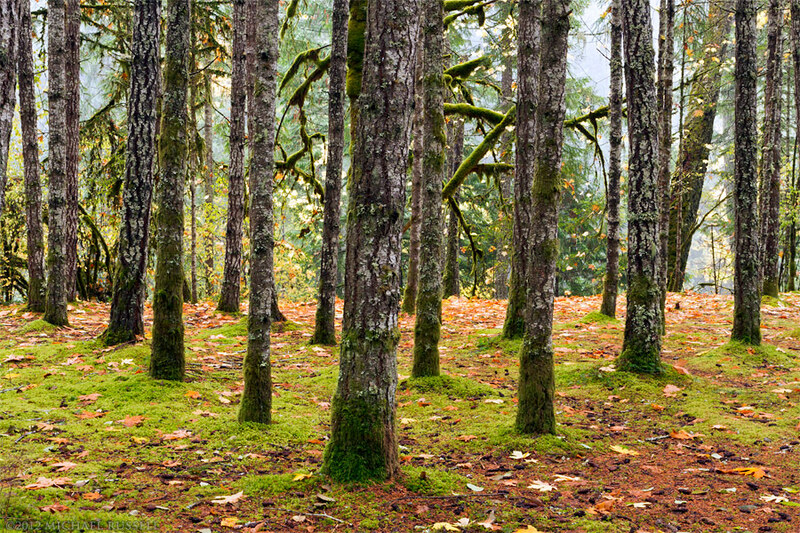 For more photographs of this park vist my Englishman River Falls Provincial Park Gallery. 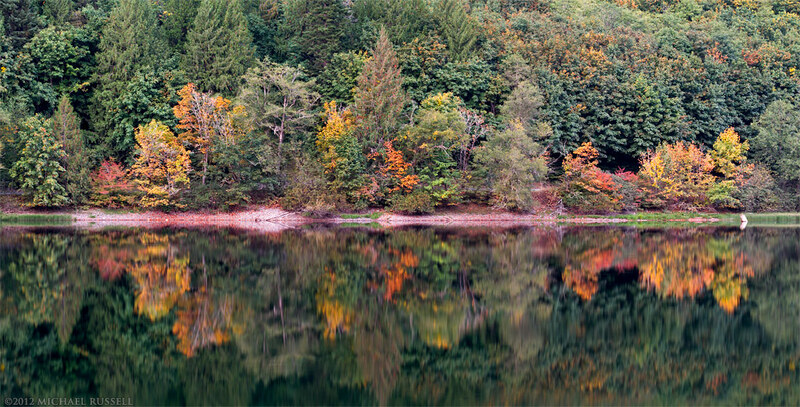 Panorama of Vine and Bigleaf Maples showing some fall foliage colours along Silver Lake in Silver Lake Provincial Park near Hope, British Columbia, Canada. 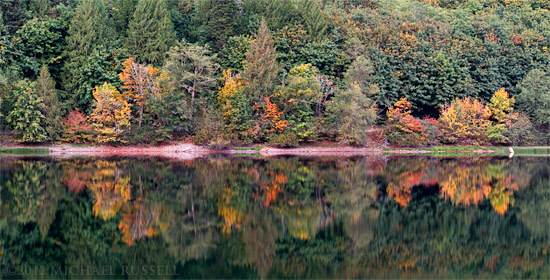 In late September I went to Silver Lake Provincial Park in the Skagit Valley near Hope, British Columbia. The Fall colours had just started to appear. A few weeks later, however, they were almost in full swing. The above panorama was made about 3 weeks after my previous shot – how quickly things change! Again I was very lucky to have a near perfect reflection on Silver Lake – I’ve been there a few times when there were almost waves due to the wind. The majority of the Fall colours here are provided by Bigleaf Maples (Acer macrophyllum) and Vine Maples (Acer circinatum).